Bakhshi (Turkm. bagşy / bagshi) - folk singer among the peoples of Central Asia, generally performing at the celebrations. The word "Bakhshi" comes from the Sanskrit bhikshu - teacher. Mongolian Buddhists called bakhshi people who knew Uighur script, that is why in the XIII-XV centuries the word "Bakhshi" was given to scribes. In the existing system of Bakhshi education the significant place was given to poetry contests. 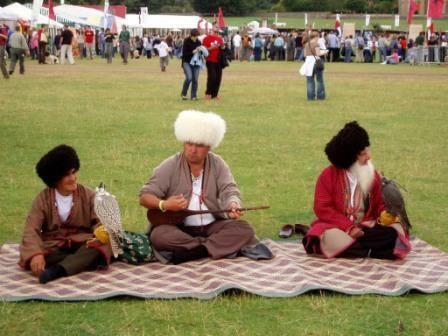 In Central Asia Bakhshi were the guardians of national music and folk traditions, they also spread the classics. Music for the Turkmen is a life of people, placed in sound, honest story about the anxieties and joys, suffering and happiness, the beauty of the soul and heart disturbances. It is able to heal wounds, soothe, or pour into a human vitality. The art of folk singers in the country is highly respected and honoured. Their names are always within hearing, and the history of life's way is surrounded with mystery and often overgrown with legends. Dutar is the inalienable part of bakhshi. Dutar is a two-stringed musical instrument, the length is from 1 to 2 meters with a pear-shaped resonator and a highly elongated neck with a fingerboard. However, playing dutar is not the main purpose of bakhshi, the main appropriation is singing. The strong voice of the performer and the quiet, measured sound of the instrument - two ingredients for successful national songs, so there are no any special occasions or holidays in Turkmenistan without "bakhshi" - singers, storytellers of ancient "destans".